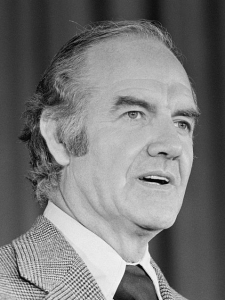 Democratic U.S. senator from South Dakota, McGovern emerged as an anti-Vietnam War presidential candidate, challenging Republican incumbent Richard M. Nixon in 1972. McGovern not only advocated an immediate end to the war in Vietnam, he called for a broad agenda of social and economic reforms that recalled Lyndon Johnson’s “Great Society” program of the 1960s. McGovern’s liberal stance failed to unify the Democratic Party, and he lost to Nixon by a landslide.